Plastic bags cause all sorts of issues when they enter the waste stream. Because they are so light, they often blow around, getting caught in trees and waterways. The longer they are stuck in these areas, the more toxins they release into the environment. Plastic bags also directly harm animals, either by getting caught around them and causing them to choke, or poisoning them when animals mistake bags for food. 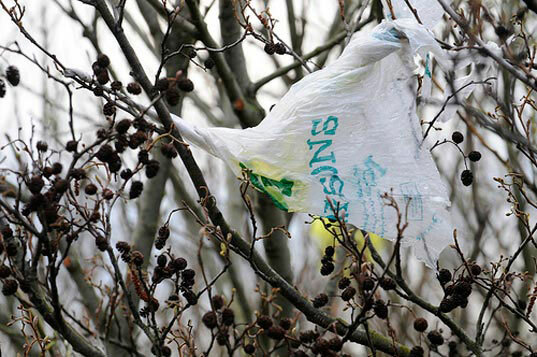 When plastic bags are thrown away into the landfill, they do not decompose. When it comes to plastic bags, it’s best to follow the golden environmental rule – reduce, reuse, recycle. California recently became the first state in the U.S. to ban single use plastic bags. Beginning July 2015, California grocery stores will no longer be allowed to offer plastic bags for free, and customers who do not have reusable bags can be charged up to $0.10 to use a paper bag. Here in New Jersey, however, single use plastic bags are still an accepted part of everyday life. Most of us end up accumulating them through trips to the grocery store, pharmacy, and other convenience stores. The easy thing to do is purchase reusable bags; the hardest part is remembering to use them! The smartphone app, My Eco, tracks your use of reusable bags and alerts you to remember them when you enter a store. It also helps to leave reusable bags in your car. There are plenty of ways you can reuse plastic bags – whether it is making craft projects or using them as pet waste bags. Check out our Pinterest page for plastic bag project ideas. There is a common misconception that plastic bags can be placed in your curbside single stream recycling bin in Atlantic County. While the plastic is recyclable, it cannot be mixed with the rest of your household recyclable material. The recycling center in Atlantic County, operated by ReCommunity, uses a largely automated system to sort the materials that come in. The plastic bags get twisted up in the gears of the system and cause major problems with the machinery. You cannot recycle bags in your blue bin, but you can bring them to many local stores, like Shop Rite or Target. These stores have specified plastic bag recycling bins that keep the bags together and make them easier to recycle. For information on where to recycle your plastic bags, click here.